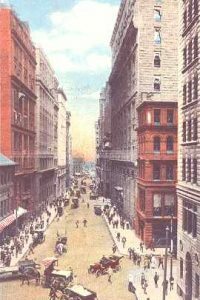 Change Alley was a seven-foot wide passageway located on State Street opposite the old Boston Stock Exchange Building. In the image above, the alley was located on the left between the tall brick and granite buildings. For many years, Change Alley was used by merchants as a shortcut to get from Quincy Market to State Street. When the 60 State Street tower was built in the 1970s, the "avenue" was eliminated. In the 1700s, the Royal Exchange Tavern was located near the alley, which had an open air arcade-style first floor. Patrons used to meet in the tavern ad hoc or "on change" to conduct business there, and the passageway was eventually renamed Change Alley due to this activity. During the 1800s, the lane attained the nickname Damnation Alley. One can infer that vulgar language was employed by the wagoners as they met head-on in the middle of the narrow alley while traveling in opposite directions. Shouting matches, and even fighting, likely occurred at such confrontations. Damnation Alley was the title of a 1977 science fiction film with George Peppard and Jan-Michael Vincent. The pair worked in a missile silo, and global nuclear warfare breaks out. After great devastation to the planet, the survivors travel from the west coast of the United States to upstate New York, and experience extreme weather events and great oddities along the way. The path of the trip was called Damnation Alley. The movie was loosely based on a 1969 book of the same title by Roger Zelazny. In the book, this drive through devastated America was from Los Angeles to Boston. One has to wonder if Boston's Damnation Alley was the inspiration for Zelazny's title.